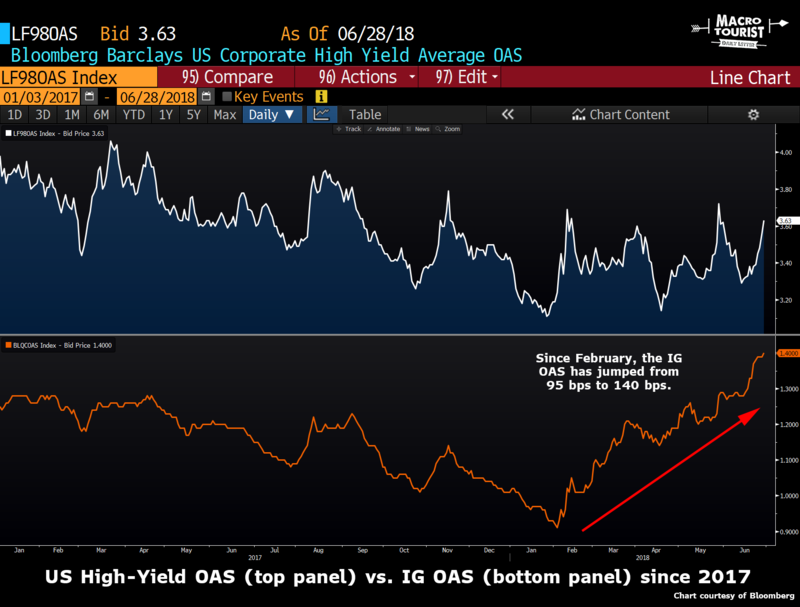 Last week’s piece about the widening of investment-grade credit versus high-yield got so many intelligent responses, I thought instead of writing on a new topic today, I would take the lazy route and simply share the insights. Quick recap – although most risk-on indicators are sitting near recent highs, investment-grade bonds have had a terrible six months. some investors wonder if the collapse of General Electric is disproportionately influencing investment-grade indexes. another shrewd reader notes that investment-grade bonds were a natural substitute for US-Treasuries during Quantitative Easing, and now that we are entering a period of Quantitative Tightening, IG might be feeling the effect of the Fed’s balance sheet runoff. 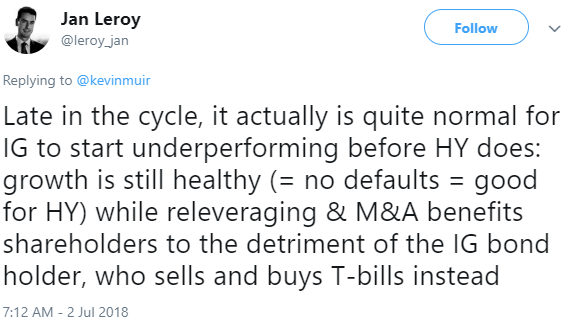 a bond trader who knows more about the intricacies of the bond index make-up than I ever will suggests that investment-grade indexes are suffering from an overall decline in the credit quality of the index (ie: there are less AAs and more BBBs). Therefore, bond investors are rightfully marking up OAS IG spreads. one macro trader who follows the cost of hedging IG credit for non-USD investors notes that IG returns are now negative for Japanese investors who want to hedge the currency. 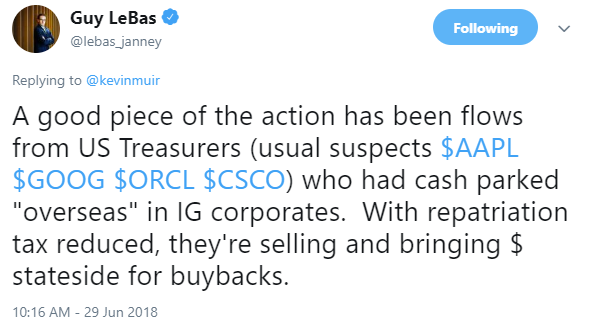 finally, one trader who tracks issuer flows comments that HY companies are increasingly tapping the levered-loan market instead of issuing paper, while IG companies are selling debt heavily. the high-yield market is smaller than investment-grade, so the “dumb bid” from ETFs and other passive “risk-on” strategies has an outsized effect on high-yield bonds. 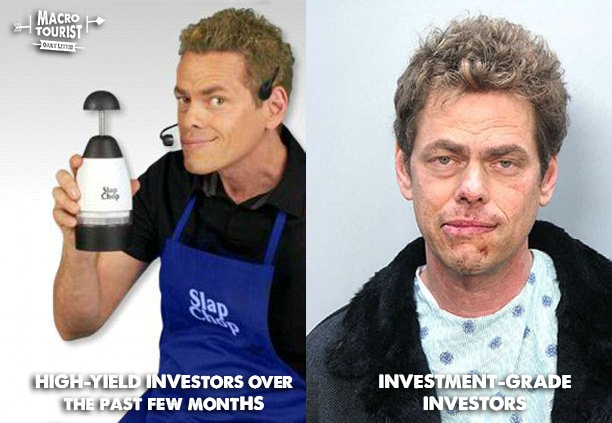 So it’s not so much that IG is trading poorly, it’s that HY is trading much too frothy. we all know the story about how large multinational companies have been the largest investors in US dollar bonds overseas. With the passing of the recent tax reform package, companies are now incented to bring that cash back home to the United States. Hence, IG is offered. the recent spate of M&A’s has resulted in companies taking more leverage, decreasing the credit quality of their bonds.